Hello, Makers! Today I’m back with a two vastly different “tricks” on estimating yarn for cast ons. I’m giving you mine, which I hope makes you giggle, and then a far more accurate tip/trick I learned from a former student of mine. This amazing woman has been knitting for more decades than I’ve been alive and while I’m always honored to teach knitter something new, I’m even MORE invigorated when a veteran knitter is willing to teach me something. So heres little ol’ me, passing on decades of information to you! When I first started learning to knit via booklets available at local craft stores, the most common cast on was the Knitted Cast On. The Knitted Cast On is a short tail cast on method where by a slip knot is created just 6″/15cm (or so) from the end of the working yarn, and stitches are knit onto the needle. Nowadays (close to 20 years later.. really?! Jeez… yep, really… almost 20 years) the most common cast on is the Long Tail Cast On method, or some iteration of a long tail method, such as the German Twisted Cast On or the Long Tail Tubular Cast On. 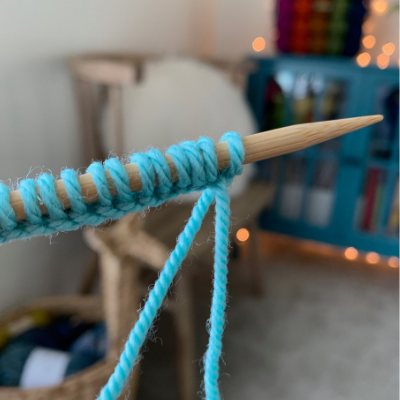 The biggest “gotcha” of any long tail cast on method is estimating how much yarn you need to wind off before placing your slip knot (or creating your first stitch if you don’t prefer to start a cast on with a slip knot). I hope you’ll add one (or both) of the following two methods to your bag’o’tricks for future projects. Admittedly, this is MY tried and true method. It rarely fails me but it’s definitely not particularly accurate. For the average woman, one full arm span from hand to hand (imagine you’re standing like the Anatomical Man with your arms spread wide, side to side, with the tail end of the yarn in one hand and the working end in the other) of worsted weight yarn is 80 stitches. Already I know you can see the flaw in this method. Or should I saw flaws, plural. 1) The arm span of someone like me (I stand at a whopping 5′ 3″ tall) is vastly different than that of my best friend who is 5′ 11″. If you’re curious, she refers to me as someone with T-Rex arms from time to time.